Silk Air has taken ownership of its first B737-800 today, signifying the beginning of its planned transition from an exclusively Airbus fleet to one that will eventually become all B737s, including Max. In 2012, the carrier, a regional subsidiary of Singapore Airlines, announced that it had signed up for 23 737-800s and 31 737 Max 8s, with the option to modify the order to include different variants of the 737 family. The deal, largest in the airline’s history, was worth US$4.9 billion at listed price at the time of signing. Silk Air chief executive Leslie Thng would not reveal the costs involved in the transition, which includes retraining of pilots and cabin crew, as well as purchasing 737 simulators – the airline has obtained two thus far – but he emphasised that the “capital and human resources investment will make SilkAir well positioned to put forth the company’s expansion plans” and to “maintain double-digit growth all the way to the end of this decade”. Various aircraft manufacturers, including Boeing’s archrival Airbus as well as Embraer, Bombardier and Mitsubishi, had submitted proposals to the airline and Boeing was deemed to be offering the best overall package. The new 737 will have more seats than the A320 Silk Air currently operates, with 150 in economy instead of 138. The number of business seats, at 12, is the same. Thng said that the increase would help his airline better serve routes where demand had exceeded capacity. The flying experience will also be improved, particularly the inflight entertainment (IFE). “On the A320, the inflight entertainment is a drop-down screen from which we show silent movies, the more popular being Mr Bean and Just For Laugh, but on the B737, because we have audio outlets we can show short features and we will provide music options,” He said. And a good news for the gadget-clad road warrior – in-seat power sockets will also be available on SilkAir’s new B737. A trial is being conducted for wireless IFE streaming and Thng hopes that it will officially become available in Q2 this year, which means passengers on longer flights of three to five hours will get to enjoy up to 20 movies, 10 short features and 100 music albums from their wifi-enabled devices. But he added that inflight Internet will not be available. Thng admitted that the burgeoning low-cost carrier sector has posted competition to Silk Air on some 27 routes, but he remained hopeful that the new aircraft would attract business from those who “want to pay a slightly higher fare – value-for-money fare – to travel on a product that gives them comfort and a peace of mind”. 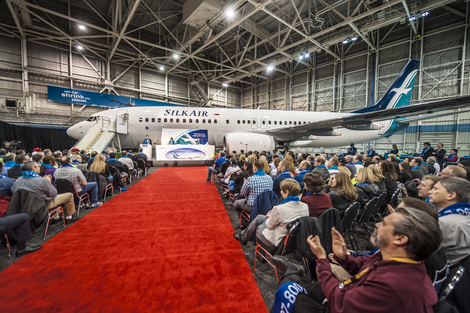 There are a total of eight 737s scheduled for delivery to Silk Air this year. The new B737 will make a multiple-leg journey to Singapore on Wednesday, to arrive in time for Singapore Air Show. Stay tuned for more coverage and images.